The European car industry had a solid 2017, with new registrations totalling 15.57 million, an increase of 3.1% when compared to 2016 and the highest volume of registrations since 2007 when 16.02 million units were registered. These strong results can largely be attributed to Eastern and Southern Europe, where volume grew by 12.7% and 6.2% respectively, but there is still concern over the results of the UK. Despite the encouraging results, the issues faced by the industry including the diesel crisis and Brexit had a negative impact on growth, which slowed down to just 3.1% – a decrease on the 6.5% and 9.3% volume growth experienced in 2016 and 2015 respectively. Disappointing results for December represented the lowest registrations for the month in five years, which indicates that the industry could be slowing down. This was exemplified by registrations of diesel vehicles, which decreased by 20.5% in December 2017. In fact, the downward trend in diesel impacted full year figures for 2017 too, with diesel volumes falling by 7.9% to 6.76 million units (data excludes Hungary), accounting for just 43.7% of total registrations in 2017. This is the lowest market share for the diesel segment for 10 years. Gasoline cars were able to benefit from the decline of diesel, growing by 10.9% – an increase of 760,000 units. Comparatively, AFVs accounted for only 4.8% of registrations, a total of 737,400 units, which was a volume change of 46.1% on the previous year. These registrations were split between hybrid technology, electric and plug-in vehicles. “The vast majority of market growth in 2017 was driven by SUVs, which posted a record 4.56 million registrations in 2017. Comparatively, SUV registrations in 2016 were just 3.81 million units – meaning volume for the segment grew by 19.5% in 2017. As a result, market share for SUVs has jumped from 25.2% in 2016 to 29.3% in 2017. A sharp contrast to 2007, when SUVs represented just 8.5% of market share. This growth was possible thanks to the strong performances of the D-SUV, C-SUV and B-SUV sub segments, which grew by 34%, 21% and 17.5% respectively. The monumental growth of SUVs impacted the MPV segment, as MPV registrations decreased by 15.1% in 2017 – the lowest market share of the century,” commented Felipe Munoz, Global Automotive Analyst at JATO Dynamics. The acquisition of Opel by PSA did not help the French manufacturing group to flourish in 2017, with growth for its Peugeot and Citroen brands offset by the declines of Opel – resulting in overall growth of just 0.7%. VW Group lost 0.25 percentage points of market share, but despite this it managed to increase its volume by 2% to 3.70 million units. 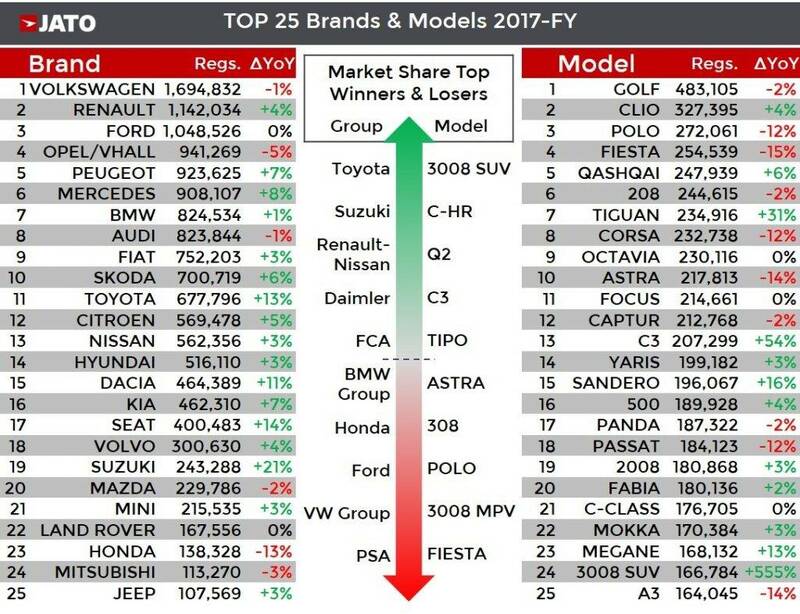 The small increase can be attributed to the Skoda and Seat brands, which increased SUV sales by 74% and 254% respectively. The Golf retained its position as Europe’s most popular car in 2017. Despite this, its volume fell by 1% and it was the top seller in just five European markets in 2017, compared to eight in 2016. 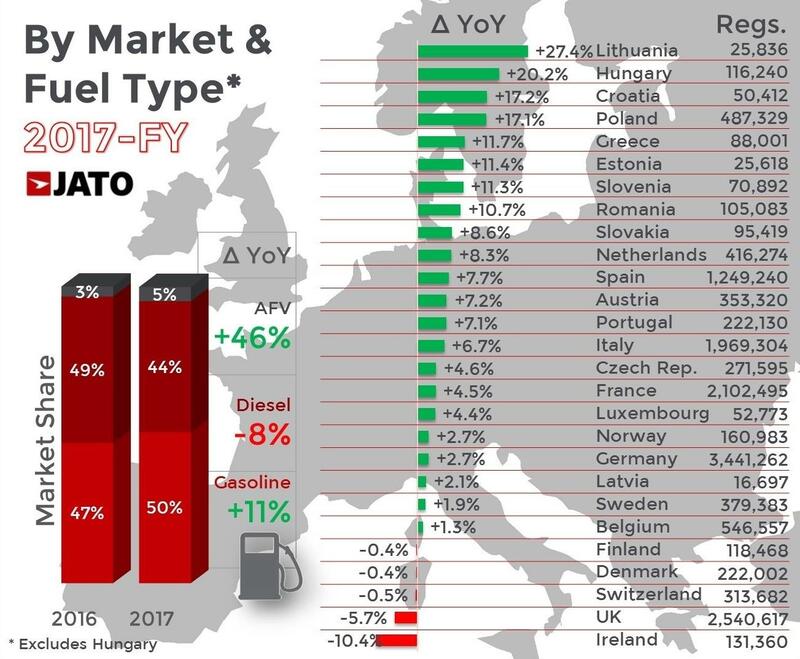 More than half of its registrations were in Germany and the UK, and it was also heavily affected by the diesel crisis, with its diesel registrations falling by 14.6%, counting for 41% of its total sales (47% in 2016). 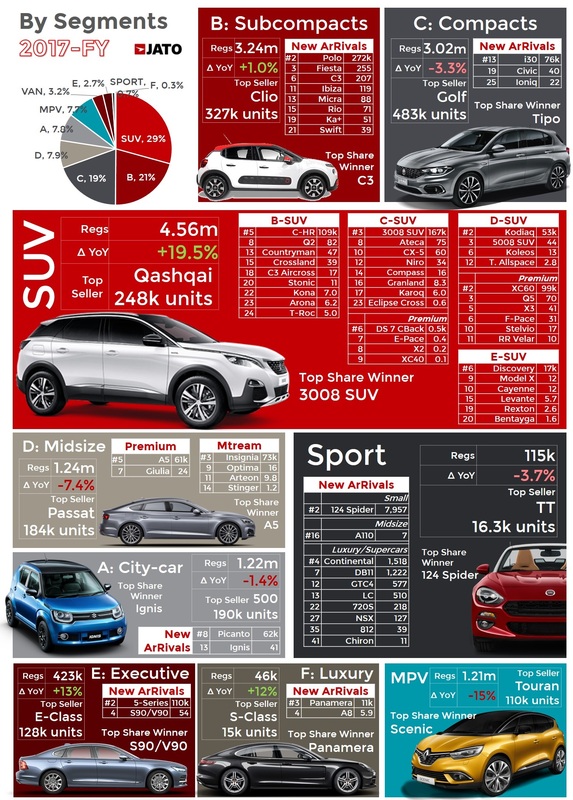 The Qashqai was Europe’s best-selling SUV for the second year in a row, hitting the top five in terms of model registrations for the first time ever. The SUV was able to improve its position despite the volume growth of the Tiguan, which was just 13,000 registrations behind. Likewise, the Peugeot 3008 became the third best selling C-SUV of 2017.